After a couple of days with exceptional good flying weather in early April, we now have another very good week. Friday we had a good afternoon and evening for towing our paraglider students. On Saturday I went to Jämi where it was too windy in the afternoon but in the evening we could open the season there too. 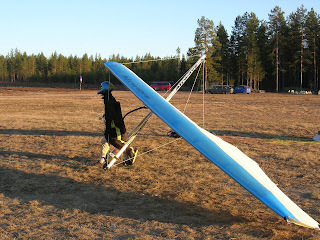 I practiced hanggliding for a change; I keep my good old Airwave Klassic (picture above) there at Jämi. In the evening we enjoyed of course a sauna, together with the sky jumpers of the Tampereen Laskuvarjokerho. Their pilot was kind enough to share his hotel room with us, thanks! Sunday we woke up to a sunny sky again and started to tow in the morning. It was calmer now but with clear signs of thermal activity. I did a hanggliding flight first and already could stay up for a while. A little later I took my son up for a paragliding tandem flight and we quickly went up to 1100m. Where it was freezing cold of course! But the views were nice and I was considering flying cross-country but then realized that we were not prepared for that. No wallet, no phone, no water and not enough clothing. So after boating around for half an hour we searched for some sink and then flew down, landed and warmed up ourselves again. Later spent another half hour flying the, now weaker, thermals with my hangglider. Once back home had another sauna to truly warm up again, and surely had no trouble falling asleep. Meanwhile some other pilots enjoyed very good conditions at Kiikala airfield. Below a picture by Kimmo who was at Kiikala for the first time and was up for several hours!